A couple of interesting stories found on the web about some of absinthe's cousins. These are drinks that also taste like licorice (or, to be more specific, anise-flavors). Local favorites like ouzo (Greece), raki (Turkey), Sambuca (Italy) and PatxarÃ¡n (Spain) all use anise as a flavoring and many can be watered down and "louched" just like absinthe. This article, from the St. Petersburg (Fla) Times, has a very nice picture of a louched ouzo, a very pretty pearly white. The author describes the Greek culture" surrounding ouzo, some different brands, and how to drink it. Also included are some foods that go nicely with this pastis. In The Spirit World, Brenda is Raki'n and Rollin' in Turkey. An even closer relative to absinthe than ouzo, raki goes way back and is often recommended by real absintheurs as a good baby step towards enjoying the much more complex emerald liquor of absinthe. And it has the added benefit of being available on most liquor store shelves! She also points out some good brands to try, as well as food to eat with it. But today, dinner or a drink at the Procope is a cheerful affair and the place has a fantastic buzz on a Saturday night. Itâ€™s colourfully done out in gilt, red, plush, chandeliers, mirrors, pictures and quaint objets dâ€™artâ€”which, of course, include glittering Absinthe â€œfountainsâ€� . Our only real nits to pick with the article are its claim that modern absinthes are 40% to 50% alcohol (really more like 60%-75%) and quoting Madame Delahaye with the awful canard about absinthe losing its "mystique" if it should become legalized. For our sake, we are willing to take that chance. David Lebovitz admits to not liking anise flavored drinks(!) (including, of course, absinthe) but loving it as a flavor enhancer for cooking. 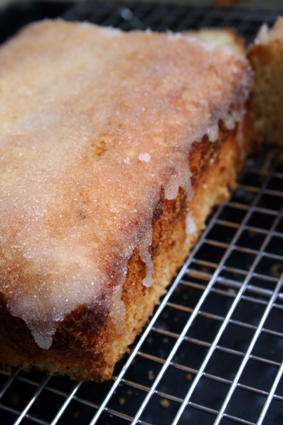 So being the expert dessert chef he is, he whips up an astoundingly delicious sounding Absinthe Cake recipe. It only uses a 1/4 cup of absinthe, so you won't be draining away too much of the precious emerald drink. And I also never heard of aluminum being in baking powder. Check it out next time you are in the grocery store. So You Wanna Buy Some Absinthe? I've now personally scored six bottles of absinthe from three different sources and I'm gonna give you the straight dope (and stop writing like I'm working on a script for Starsky and Hutch). My first absinthe purchase was made in Paris at Vert d'Absinthe, a very nice little shop dedicated to absinthe. I bought a bottle of Jade Liqueurs' Nouvelle-OrlÃ©ans and a bottle of their Blanchette. When I asked the owner of the shop about taking absinthe back to the U.S. he said that it shouldn't be a problem. He was right! I declared the absinthe on my customs form and even specifically mentioned it to the customs agent. The agent didn't seem at all interested, which I took to indicate that it's not uncommon for them to see absinthe and they aren't concerned with it. My second purchase was made online via eAbsinthe.com, a bottle of La FÃ©e Parisian 68% and a bottle of La FÃ©e Parisian 45%. (I was curious about the differences in alcohol content.) I was surprised at how easy it was to place the order and pay for it - maybe only a little bit harder than ordering something from Amazon. eAbsinthe ships from the U.K. and so I was expecting to have to wait a while to receive my absinthe, but a nice heavy package arrived 4 or 5 days later. The absinthe bottles were carefully packaged in molded styrofoam and a little bit of butcher paper. I was a little concerned about the bottles breaking during shipping but they definitely know how to pack them. My third experience was also online and just as easy as the second. I ordered a bottle of Jade's Edouard 72 and a bottle of Verte Suisse 65 (as well as a couple of absinthe reservoir glasses). This time I ordered through Liqueurs de France. They have a very nice site with a lot of good information about what you're buying. It was again very easy to place the order and to pay for it. Again, the order arrived fairly quickly in a very well packed box. My conclusion is that if you want to get yourself some absinthe it's actually pretty easy. The next question is: Will easy availability remove some of the mystique and desire? An interesting Q&A with Ted Breaux, the chemist mastermind behind the Jade Liquors absinthes and someone who is very important in the world of today's absinthe. He was interviewed at Tales of the Cocktail, a conference in New Orleans we here at InAbsinthia surely wish we could be at! Absinthism was a major reason absinthe got banned at the turn of the 19th century. A specially identified variation on alcoholism, absinthism in particular was supposed to lead to such ailments as brain damage, psychosis and even suicide. Various "studies" were done, many of them with bad or even non-existent scientific rigor, and they supposedly were able to differentiate between a 140 proof liquor containing thujone (the active ingredient in wormwood) and one not containing thujone. Today, most of these studies have been called into question, and there is little support for a specific disease called absinthism. Wormwood has a historical dark side: absinthe. This clear green alcoholic beverage, which contains essential oil of wormwood and other plant extracts, is highly toxic and presently banned in many countries. A favorite liqueur in nineteenth-century France, absinthe was addictive and associated with a collection of serious side effects known as absinthism (irreversible damage to the central nervous system). The toxic component of wormwood that causes absinthism is thujone. Wormwood may contain as much as 0.6% thujone. On the other hand, wormwood soaked in white wine is used to produce the liqueur called vermouth (derived from the German word for wormwood, Wermuth), which contains very little thujone. - Wormwood. Belinda Rowland and Rebecca Frey, PhD. - Gale Encyclopedia of Alternative Medicine. Ed. Jacqueline Longe. Vol. 4. 2nd ed. Detroit: Gale, 2005. p2164-2166. 4 vols. Ooo, watch out for the "dark side"! This "toxic liqueur" is at it again, with "irreversible damage" to the nervous system, its "addictive" nature and the mythical disease of "absinthism". And vermouth doesn't contain wormwood or thujone, or it too would be a controlled substance like absinthe. As we've mentioned before, bad information about absinthe abounds, both on the Web and in print. Even many of the web sites you find that sell absinthe and fake absinth (sic) products push inaccuracies as a way to sell bad stuff to unsuspecting buyers. Any site selling absinthe that makes a big point of thujone content is immediately suspect and shouldn't be used. All respectable absinthes have almost no thujone content, and not nearly enough for any effect. Even drinking those terrible Czech concoctions which push their "100mg" of thujone does not actually get you enough for hallucinations to set in before the high alcohol content takes over. absinthe, an emerald-green, toxic liqueur distilled from wormwood and other aromatics, including angelica root, sweet-flag root, star anise, and dittany, which have been macerated and steeped in alcohol. It was invented by a Dr. Ordinaire, a Frenchman who lived in Switzerland. Genuine absinthe is 70% to 80% alcohol. Because of the harmful effect it has on the nerves, it has been banned in most western countries. "toxic" - absinthe in not toxic, as your faithful writers here at InAbsinthia can attest. There has been no reputable study that would indicate otherwise. "liqueur" - a common misconception, absinthe is not a "liqueur" (a sweetened, flavored, low alcohol digestif). It is a "liquor", as it is not sweetened, it has a very high alcohol content and is usually an aperitif. "angelica root, sweet-flag root, star anise, and dittany" - While there are many different recipes for absinthe, I'm not sure where they got this list of ingredients. As discussed here, nearly all good absinthes use green anise, not star anise (anise gives it the licorice flavor, although more sophisticated palates than ours have said there is a difference between licorice and anise flavors). And the other main ingredients in absinthe are fennel and hyssop. So the list of ingredients found in the definition are unusual, to say the least. "macerated and steeped in alcohol" - while this is one method for producing absinthe, it is not considered a "good" one. Most respectable absinthes are distilled like normal liquors, and the herbs are used in the flavoring process. 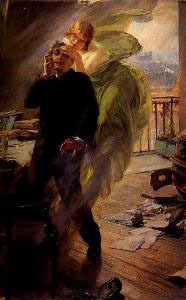 Several cultural functions were served when Ordinaire and not Henriod was seen as the originator of modern absinthe: it meant the drink was a product of science rather than folk medicine; it became the creation of a man, not a woman; and if it had been made by a Frenchman only staying in Switzerland then it could be claimed as French, not Swiss. This creation of a culturally acceptable myth was characteristic of the whole long history of absinthe, in which the green fluid accepted whatever desires were projected onto it and combined with them in an opaque, cloudy mix. "70% to 80% alcohol" - while some may reach these dizzying heights, most are more like 60% to 70%. "harmful effect it has on the nerves" - again, this isn't true in the slightest, despite repeated claims. Absinthe was a victim of the nascent Prohibition movement and became an easy target for bad science and while thujone in very high amounts is bad for you (as are many things), it can't happen via absinthe. "banned in most western countries" - it is neither banned nor in most western countries. These days, it is actually legal in many western countries (including all of the European Union), and even where it is controlled, like in the United States, calling it "banned" is an exaggeration. It can't be sold, but it can be possessed, unlike say marijuana or machine guns. Phew! Wow, makes you wonder exactly how many other bad entries are in this encyclopedia, doesn't it? Absinthe, as you may imagine, has a very checkered history when it comes to the law. And it is currently even more confusing, given its long dormant history and vast supplies of misinformation. For instance, here in the US it is illegal to sell or import any drink that contains thujone, a key ingredient in absinthe that comes from the wormwood (Artemisia Absinthium) plant. Thujone is called a "known harmful" ingredient, so the FDA bans its use in food for human consumption, so you can't sell it, but you're allowed to buy, possess it and, yes, even drink it, because the FDA only goes after sellers, not buyers. But here's a good link with thumbnail sketches of absinthe's legality in many countries and areas around the world. I have been reading some debate about its Canada entry, as even the officials there seem to be confused as to its real status, as opposed to its "I think..." status. Ask Erowid : ID 2693 : Is it illegal to import absinthe into the US? Interesting quickie list of absinthe reviews from the mostly German site Absinthe-Guide.de. A very long list of absinthes are given one of 4 ratings - recommendable (sic), neutral, not recommendable and not rated yet. I have no idea of the quality of the reviews themselves, but they do like our favorite, Nouveau-Orleans and pretty much dislike all Czech brands, so the reviews seem inline with the general consensus. Let us know what you think of their reviews. Here at Chez InAbsinthia, we've only tried the Nouvelle-OrlÃ©ans on this list, but we will certainly be trying to taste our way through the rest. Note especially the high ranking Eichelberger, which is a very reasonably priced (for an absinthe) German-made absinthe, and the Montmartre, another value absinthe from Austria. Banned for almost a century until its recent revival, absinthe is something of a "living fossil", a coelacanth amongst drinks, able to magically transport us back to the glittering world of Paris and the Belle Epoque, a world of bohemian musicians and writers, of the Moulin Rouge and the cafes of Montmartre, a world of starving struggling artists and glittering courtesans. A particularly fascinating and tragic figure from the height of the Paris Bohemian era, Charles Cros was an inventor, mathematician, and poet. While his poetry mostly languishes in obscurity, he is well known for one poem written about absinthe. We followed up our tasting of Blanchette by making the only real cocktail that features absinthe. The Sazerac, called "America's First Cocktail", dates back to the 1830s, as discussed on Sazerac.com. Sure, there are other cocktails recipes that use absinthe. Heck you could even write a book about them if you were so inclined. But they are mostly silly concoctions that don't add anything to the La FÃ©e Verte experience. The Sazerac, though, is the real thing. Shake well in a cocktail shaker full of cracked ice and strain into a chilled cocktail glass. This particular recipe wasn't anything to write home about, really. All we could taste was the bourbon, which meant it was a waste of some good absinthe. We actually used (gasp!) Angostura bitters, and not the real Peychaud's. We should order some online, just for the authentic taste. A more interesting sounding recipe comes from the Wikipedia, which uses a method more often specified of swirling the absinthe around in a glass. It still doesn't sound like there would be enough absinthe to really show up in a cocktail glassful of bourbon, though. Maybe we should also try a more subtle taste, like Dewar's whiskey.